I know this sounds cliche, but I’ve always loved food, especially desserts. I’ve always been a big eater — the closest I’ve ever come to dieting is that month when I went sugar-free on a challenge from my boyfriend. But I sometimes worry that this blog is changing my perception on food, especially since I definitely feel the pressure from my recent success. For instance, these days, I shy away from making baked goods that aren’t photogenic, or I’ll post a recipe that I’m unhappy with because I feel the pressure to post something new. And that’s when I know things are heading in the wrong direction — when I’m posting for the sake of posting, and not because I love the recipe. I don’t know where the line between a good food blogger and a bad food blogger is, but I suspect it’s somewhere around that point. Anthony Bourdain once berated these three food bloggers for loving food so much, that their love was lost in their obsession in capturing the moment. He criticized them for turning food into a competition about being there first, knowing the most, and one-upping their peers by doing so. Similarly, I recently attended an event that I thought was a potluck amongst food bloggers, only to discover that it was an event of bartering instead of sharing. I hated that it pitted goods from one person against another, inadvertently assigning values to different people’s goods based on the quantity/portion of their goods being exchanged, as well as what was being swapped for what. I felt like I was in the middle of some cutthroat competition where people were judging me and my baked goods. That might be some people’s cup of tea, but it took me by surprise since I hadn’t known what to expect. But I did know that it wasn’t to be bid on — instead, I had just wanted to share my goods indiscriminately. I once read somewhere that the reason why humankind became the dominant species was because of the way we consumed our food; it was the ability to cook, as well as the act of sharing the food that allowed us evolve to our current civilization and society. And there’s something to be said about that. Blogging, the love of food, and general DIY should never be a judgement and numbers game, where one measures success based on the number of pageviews, pretty pictures and content, and overall popularity. It shouldn’t turn people into judgy jerks and provide a means for one to feel superior about oneself. No — it’s always been about sharing. That’s why I worry about the mindset I sometimes get into. I shouldn’t be blogging for the sake of blogging! Instead, I should be making sure that my blog always remains a medium for me to share the recipes that I’ve enjoyed and made me happy. I'm not here to post things for fame or superiority; I'm here posting these recipes so that other people get the opportunity to make and enjoy them too. I’ve been wanting to make a sandwich cookie for a while now since I’d spied one of my favorite bakeries, Miss Zumstein’s, beautiful versions. I was inspired to make a brownies and cream cookie because that combination is one of my favorite desserts. For me, there’s nothing more comforting than a warm brownie topped with some cold, creamy ice cream. Making the cookies was also an especially fun process — I used a butter knife to dole out dollops of cream on each cookie, and proceeded to (gently) smash the two cookies together. If you’re worried that the whole cookie sounds a little bit too frighteningly sweet, don’t! 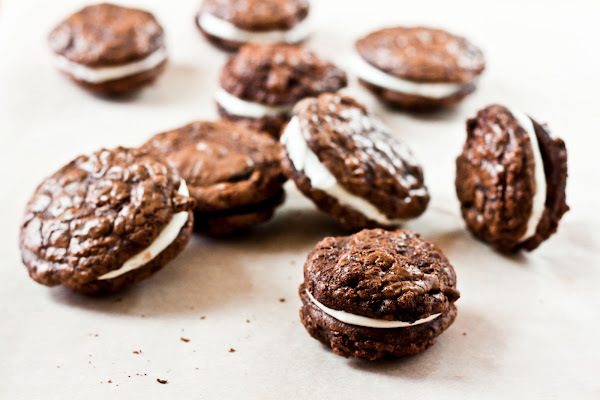 I made sure to use an intense and almost bitter chocolate batter for the brownie sandwiches. 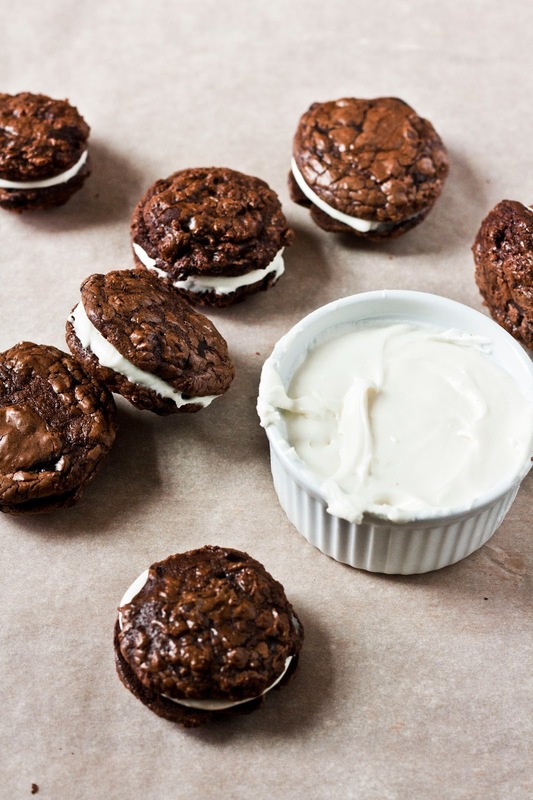 The trick here is to use 100% unsweetened chocolate for the brownie dough. The bitterness of the chocolate will balance out the sweetness from the sweetened condensed milk cream. Preheat the oven to 350 (F), and line two cookie sheets with parchment paper or a Silpat mat. Combine 7oz. of chopped unsweetened chocolate together with 3 tablespoons unsalted butter in a double boiler (or, use a heatproof bowl set over a pan of boiling water, making sure that the bowl's bottom does not touch the bottom of the pan). Use a heatproof spatula to gently stir together until melted and smooth. Set aside on a wire rack to cool. Combine 2 eggs, 2/3 cup sugar, and 1 teaspoon vanilla in the bowl of a freestanding electric mixer with a paddle attachment and beat on medium speed for at least 5 minutes, until pale and creamy. Reduce the mixer's speed to its lowest setting, and add 1/4 cup flour, 1/4 teaspoon baking powder, the remaining 5 oz. of chopped chocolate, and the melted chocolate mixture (from the first step). Mix only until ingredients are just combined, and set aside to stand for 10 minutes. Once the batter has set, use a one-tablespoon sized cookie scoop to scoop 1 tablespoon of batter for each cookie onto your parchment lined-baking sheets. 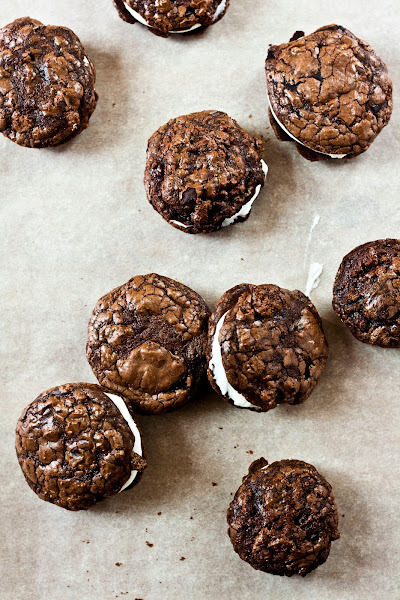 The batter won't spread out too much, but I'd still recommend 2 inches between each cookie. Bake in the preheated oven for about 8 to 10 minutes, until puffy and cracked. When the cookies have finished baking, set the cookie trays on wire cooling racks and allow to cool completely on the trays. Once the cookies have cooled completely, make the cream filling. Combine 4 tablespoons unsalted butter, 1/2 cup plus 2 tablespoons sweetened condensed milk, and 1/4 scant teaspoon of kosher salt in the bowl of a freestanding electric mixer fitted with a whisk attachment, and whisk on medium-high speed until smooth. 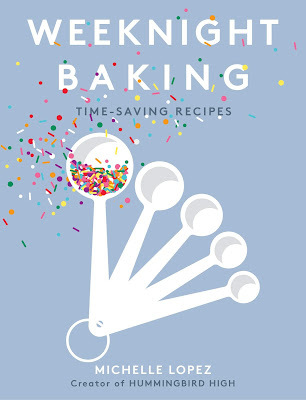 Once the mixture is smooth, lower the mixer's speed to its lowest setting and whisk in 3/4 cup confectioner's sugar a 1/4 cup at a time until combined. Once all the confectioner's sugar has been combined, whisk on high speed for a minute or so, until the filling is thick and smooth. Use immediately. Use a butter knife or an icing spatula to put a dollop of 1 1/2 teaspoons of cream filling on the center of the underside (that is, the flat side) of one brownie cookie. 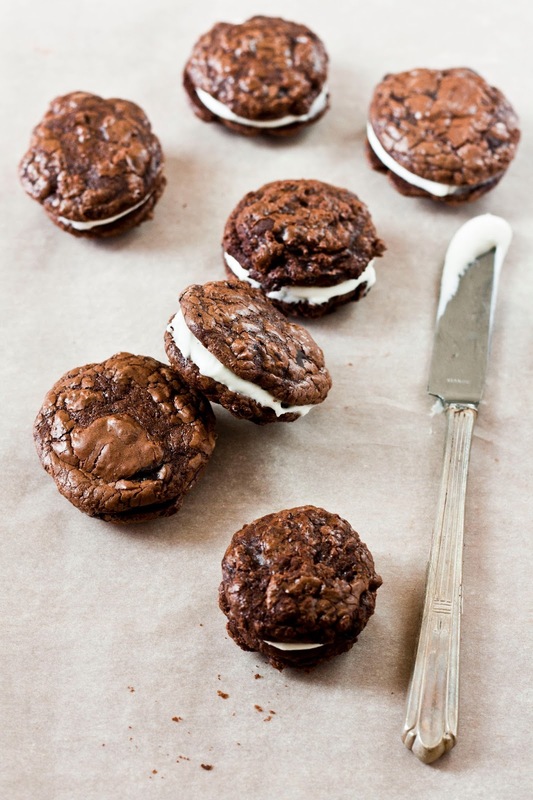 Place a second brownie cookie bottom side down on top of the frosting, and gently squish the two cookies together. There won't be any need to spread the frosting, the act of putting the cookies together will do the job for you. Repeat until you've got 16 sandwich cookies. Enjoy! I can totally understand where you're coming from. Blogging is one of the craziest things that I've ever been involved with. All the politics and the competition and the expectation are just mad. Properly mad. The only want to counteract that madness is to keep doing what you're doing in my opinion. Especially when you do it so well. Congrats on the Saveur nomination, so excited to have found your site through it and I've spent most of the day reading back through your posts. Such talents. Thanks for the kind words! I was worried that this post would come across as a little bit controversial and uppity. Thanks you for reading! PS - I checked out your blog, and I love it! Just added you to my RSS feed. Congratulations for your post. I really like to read you. Your English is great. Thanks for the comment! These sound so amazing! I have friends who are kind of food snobs and it gets so annoying. I understand not liking certain types of foods or restaurants, but you don't need to make fun of people who do! Hi there! 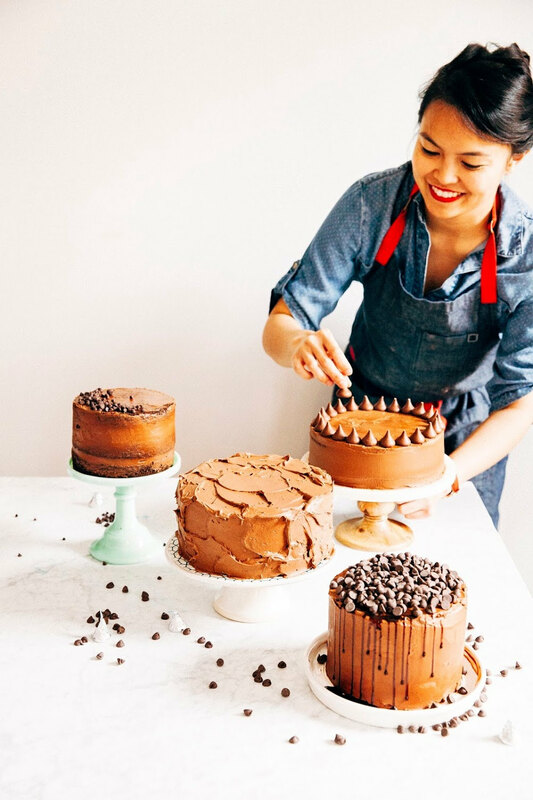 Came across your blog through the Saveur best baking + desserts blog nomination page and I'm so glad I did! Have no idea why I haven't been here before but am thrilled now. And huge congrats for the nomination! 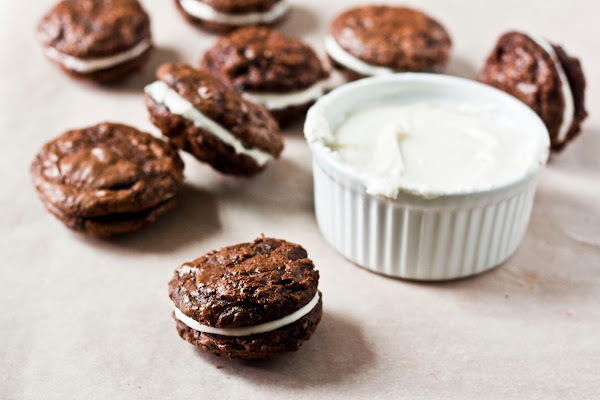 If these brownie and cream sandwich cookies are any indication of the arsenal of other delicious treats you have stored in this blog then I'm gonna be sitting here for a while. :) I love how gorgeous and crackly the cookies look and I pretty much died a soft happy death when you mentioned the cream had condensed milk in it. Ohmygah...I have cans of condensed milk always, always, in my pantry, having grown up with that flavor since I was little. Am usually cooking it up to make an easy batch of dulce de leche but can seriously just eat it straight out of the can-- no shame. I appreciate you mentioning the whole food blogging competition thing. We need to be constantly reminded of this I think as it's so easy to get lost in this world of cutthroat one-upping each other. That's not why I started my blog. I write about food because I love it and because it brings me joy to share it with others. Thanks for stopping by and the nice words! Similar to you, I LOVE sweetened condensed milk. This cream is especially awesome because you can really taste the sweetened condensed milk flavor... I've made some baked goods with sweetened condensed milk before where the flavor of the condensed milk was lost, but this cream recipe really nails it and makes the condensed milk the star. I checked out your blog and was impressed by your recipes. Definitely going to try some of them soon! Love this recipe! My brownie cookies came out a bit "taller" and less glossy than yours, although they did "crack" on top and have a good texture. Any idea what I could do to make them slightly flatter and shinier? I used all ingredients/directions to a T, down to the size 70 cookie scoop. To flatten the cookies, I would simply dip my hand in a bowl of cold water and give each cookie mound a gentle tap to flatten it before baking. That should have the effect you're looking for. As for the gloss, I wouldn't worry about it too much. I think the way I lit the shoot made the cookies look a lot glossier than they are in real life. Because honestly, if your cookies tasted good, you probably did everything you possibly could right. The rest are probably due to flattering photography. 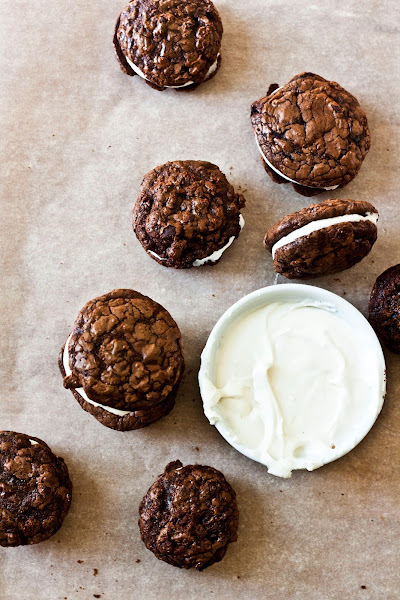 Your brownie sandwich cookies look great! I love your photography!